REHAU was originally founded in 1948 and is now one of the leading suppliers of pre-insulated pipe in the UK. Traditionally REHAU had focussed on specification-led sales but following merchant research that we carried out, it became clear that there was a need to significantly increase brand awareness throughout the trade sector. In a rapidly growing market, it was critical that REHAU extended brand awareness throughout the trade channel to increase product sales, improve brand loyalty and also increase customer engagement with the brand. Earl & Thompson were approached as a result of our experience within the trade sector. We reviewed our initial research with the merchants and then presented a proposal for a campaign consisting of three phases which would each focus on a different aim and run in turn over the course of a year. 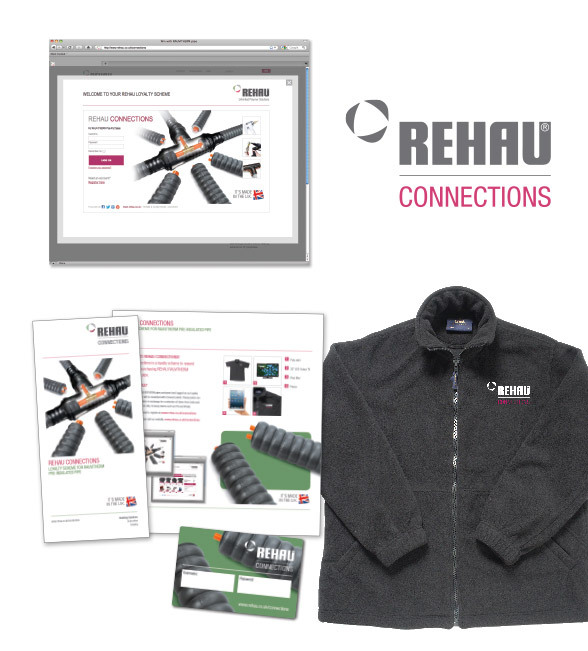 The most ambitious element of the phases was the customer loyalty scheme, REHAU Connections, aimed at improving product sales and brand loyalty among installers only. The scheme launched at the Energy Efficiency Exhibitions (incorporating Renewables Roadshow) with installers attending the show being encouraged to register online and open a REHAU Connections account. With every purchase of RAUVITHERM branded pipe and logged, points are awarded which can be redeemed at any time for a selection of items ranging from branded workwear and tools right up to luxury items such as a gas barbeque or a 32” LED TV. With a strong supporting graphical theme rolled out across all marketing collateral, the website is now handling all new account requests and customer orders, making the client management of such a project extremely time efficient. The client is very pleased with the result, with Earl & Thompson once again delivering a strategic and fully integrated campaign both within budget and on time.